I love a multi-purpose beauty product. Organic to Green is a natural brand I recently discovered through Luxepineapple and I fell in love instantly. 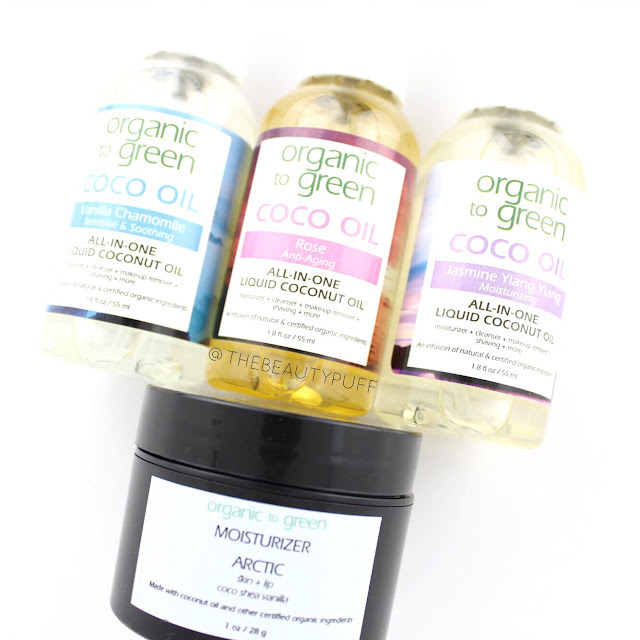 Their liquid coconut oil is like the superhero of multi-purpose beauty products! It can moisturize, cleanse, maintain frizz, and so much more! Organic to Green also makes a moisturizer that can be used on the skin or lips and it works wonders on my hands and cuticles. I've loved using these products to help moisturize my skin during pregnancy. They're all so soothing and hydrating! Let's take a closer look. Coco Oil | The first liquid coconut oil I tried from Organic to Green was their lemon scent which I absolutely love. My newest scents are the Vanilla Chamomile, Rose and Jasmine Ylang Ylang. Each of these has the same fabulous, versatile formula in a convenient pump bottle to make dispensing and application a breeze. Each one contains different oils to serve different purposes. The Vanilla Chamomile oil soothes and calms skin. Chamomile is an anti-inflammatory and helps to heal skin. It helps eczema which is really great for me since I get patches of eczema especially when the weather cools. The Rose oil contains rose fruit oil which is packed with antioxidants and vitamins to help with discoloration and dryness. The Jasmine Ylang Ylang oil helps protect, disinfect, and reduce redness on the skin. Each of these oils has the moisturizing power of coconut oil which helps strengthen, heal and soothe even the most sensitive skin. These oils are even safe for kids and with my little one's sensitive skin, these have been an absolutely lifesaver!! Arctic Moisturizer | This moisturizer is a solid balm that melts as you rub it into your skin. The formula feels so cushiony when you dig into the jar! The tiniest amount takes care of trouble spots like cuticles, knuckles, elbows, you name it. It can even be used on the lips which will be great for fall and winter! Key ingredients in this moisturizer include coconut oil, shea butter and sunflower oil. Together these ingredients moisturize, heal, soothe, and protect skin. I love that this moisturizer smells like vanilla, yum! Organic to Green makes an entire line of affordable, natural products that the whole family can enjoy. I love having products I can use on my sensitive skin as well as my daughter's. It makes our skincare collection a lot more streamline and convenient! You can find their entire range of products on their website and Ulta.com below!